Apart from the Tower, Blackpool is famous for its trams with the buses often being overlooked. 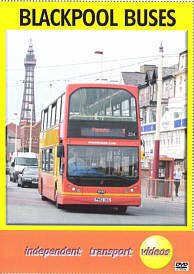 independent transport videos have put amends to this by producing this video programme dedicated to the current Blackpool Transport fleet branded as ‘Metro’. Metro was formed with the merger of Blackpool Transport and Fylde Borough Transport. Fylde B.T. was formed in 1974 from the Lytham & St Anne's Corporation bus fleet. The current double decker fleet in 2008 is made up of East Lancs bodied Tridents, Volvo and Leyland Olympians with East Lancs, Northern Counties, Roe and E.C.W. bodies. There were also four Leyland Atlanteans in stock at the time of filming. The single deck fleet is represented by DAF Optare Deltas, Optare Excels, Metroriders and Solos. The generic livery of the fleet is yellow and black. Most vehicles are in route branded liveries featuring yellow with a different colour depending on the route. For example route 1, the Promenade Line is yellow and orange, yellow and dark green is for the Fleetwood Line 14 etc. All the vehicles are immaculately turned out operating a highly efficient service along the Fylde coast. Our filming is done by location. We start at the depot on Rigby Road and visit the Town Centre, Promenade, Cleveleys, Fleetwood, St Anne's and finish at Lytham. There is plenty of action as most of the fleet are featured including two of the Atlanteans that now are reserved for schools and special contracts. To add further interest we feature some cine film taken by Bob Webster in the 1960’s of Blackpool Corporation and Lytham & St Anne's Corporation buses in service. From our own archive we present a photo gallery of Blackpool and Fylde vehicles taken in 1979, 1982 and 1986.